After ganbanyoku (hot stone therapy) cured her chronic backache and arthritis in 2016, entrepreneur Greta Ng developed a passion for wellness and health. Last June, the 70-year-old grandmother of three came out of her 18-year retirement and set up Ganbanyoku Hot Stone Therapy spa at Far East Plaza with her savings. A form of thermal relaxation therapy that originated in Japan, ganbanyoku requires a person to lie on specially-heated volcanic stone beds. These hot stones release "far infra-red rays" and negative ions that apparently help the body release toxins through perspiration as well as relax the body and mind. Far infra-red rays is a part of the infrared spectrum of electromagnetic radiation which can penetrate deeply into body tissues, generating a warm sensation. Ms Ng said the therapy is suitable for seniors with mobility issues. Ganbanyoku is also said to improve blood circulation, aid digestion, ease constipation, treat sinusitis, boost the immune system and promote weight loss. At Ms Ng's spa, each of the 16 hot stone beds is made up of three volcanic slabs and costs $40,000. An hour-long session costs $20 while a $400 package offers 23 such sessions. 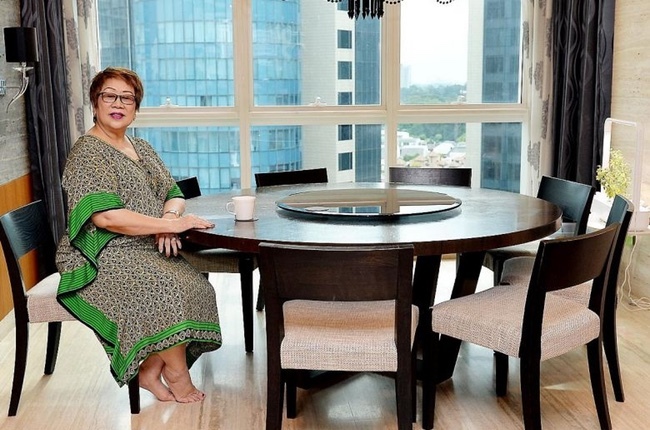 "I'm fortunate that in my younger days, I had the opportunity to make money so that I can live comfortably and pursue my interests," she said. "I've benefited greatly from this form of natural healing and thought, why not bring it to Singapore and let others experience it." After several rounds of hot stone therapy in Japan, Ms Ng said her back pain eased to such an extent that she could walk short distances unassisted, and became less dependent on her wheelchair. Previously, she had tried such treatments as acupuncture and physiotherapy but the pain persisted. Ms Ng, who was born in Myanmar and is now a Singapore citizen, arrived here in her 30s. A businesswoman from 1980 to 2000, she started off selling jewellery and branched out later into food and beverage. A divorcee, she has a 38-year-old daughter Francine Chia, who is married to a Swiss national. The couple has three children - Nico Caviezel, nine, Kayla, six, and Kyra, four. Q Please describe your residential property. A My home is a 3,000 sq ft, six-bedroom penthouse in Cuscaden Road. I bought it in 2011 for $6.5 million and took a loan for it. I chose the property because of its location and full condominium facilities. I also like it because it does not have bay windows and bomb shelters, so I get to enjoy the full 3,000 sq ft. The living and dining areas have spectacular views of both Orchard Boulevard and The St Regis hotel pool. And my bedroom is my favourite part of the apartment as this is where I can relax and rest well. Q What's in your property portfolio? A In the 1980s, I bought a 4,000 sq ft, two-storey house in Bukit Timah Road. The freehold property is being rented out. This is my best investment as I bought it for $1 million and it has appreciated to more than $7 million. The rental yield is not great based on the valuation but I will keep it for capital appreciation. I also have a three-bedroom, freehold, 1,200 sq ft apartment in Sheung Wan, Hong Kong, which is rented out. I bought it in 2011 for HK$15 million. The rental yield is around 3 per cent. There is no mortgage on both properties. Q Describe your strategy in property investing. A For property investment, I always focus on location. I usually concentrate on a few areas that I am familiar with. Price is also a big factor. Like most people, I want to pay below valuation price. I am not planning to buy any more property as I'm unable to take any more property loans owing to my age. Q What's your view of the property market? A The property market seems to be bottoming out and the many en bloc sales have added to the market euphoria lately. Q What's your financing and insurance approach? A I took the maximum loan given by the bank for my property purchases. I also buy insurance against fire and contents for my properties . Q What's your overall investing strategy? A I invest in property, bonds and insurance. I invest 70 per cent of my money in property, 25 per cent in bonds and 5 per cent in health/medical insurance. The average return for my bonds portfolio, which has an estimated value of about $3 million, has been around 10 per cent annually. It includes DBS, OCBC and UOB bonds. I also bought Universal life insurance (jumbo life insurance) - with a sum assured of US$2 million (S$2.7 million) - which will give my family a comfortable payout when I pass on. A I learnt how to invest in property from my previous boss in Hong Kong. The two main lessons: Always own the property you live in. Upgrade your property or buy additional property whenever possible. A I believe in long-term investment strategies and I always invest in products and schemes that I fully understand. I do not believe in quick money and taking big risks. A I grew up in a middle-class family of six. We were refugees from Myanmar who lost most of our belongings during the anti-Chinese movement. We learnt how to be thrifty and frugal from our parents. And we would look out for good deals when others were selling. I learnt how to seek opportunities and think ahead of others. A I'm happy with my current home. The location is very convenient. It is close to most amenities and restaurants. Most importantly, it is close to my hot stone spa.